The Maui Tropical Plantation has one of the most diverse collections of plants available for guests to explore and learn about. 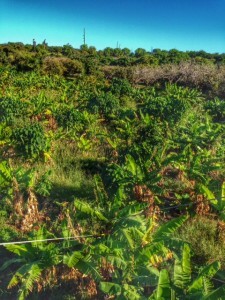 There is even a patch of Maui’s most treasured “herb” at the bottom of zipline number four… The Apple Banana. Technically the banana plant is an herb because the trunk does not have bark. It is simply a dense collection of leaves/branches, which is more like a stem. The banana herb is the world’s largest perennial herb, even though it will only produce bananas once in its life. Originating from the Latundan Banana family, Apple Bananas were brought to Hawaii by the first Polynesian settlers in their canoes. The “Mai’a” (banana) was so sacred that they were used in religious ceremonies and it was “kapu” (forbidden) for women to eat them. If a woman did eat a banana prior to the 1800’s her offense could be punishable by death. If you have never eaten an “Apple Banana” you are missing out! They are about half the size of a normal banana with a thicker peel and are very plump looking. 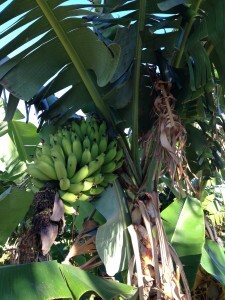 When ripe, the texture is tender and they last much longer than the common banana. Don’t eat them when they are greenish, be patient. These bananas will be delicious and not mushy, all the way until they are completely brown. The taste is sweet, tangy, and with age it gets even more tropical and complex. Some discerning palates can detect flavors of pineapple, strawberry, green apple and peanut butter. The wonderful taste is also the reason that the banana bread on Maui is so delicious. There are dozens of roadside stands that offer Apple Banana bread, and it will be the best you’ve ever had. So next time you are on the road to Hana sample the banana breads and get your taste buds ready for a treat. You can also find Apple Bananas at any grocery store and they are only 30 cents more a pound than the standard banana. Once you try them you won’t go back.